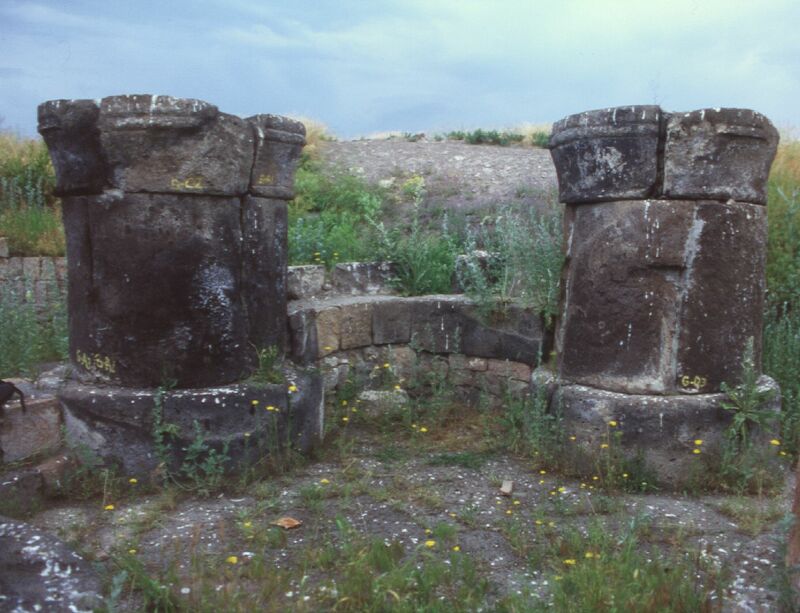 Other designations: The four-columned structure; Ateşgede. The foundations of this unusual structure were uncovered by Nikolai Marr's excavations before the First World War, during his 1909 season. Since those excavations ended, the fire-temple has been mostly ignored and omitted from maps and descriptions of Ani. 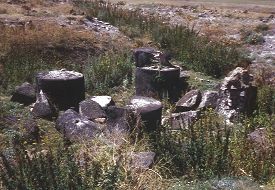 It is thought to be the remains of a Zoroastrian "fire worshipping" temple, dating from between the early first century to the middle of the fourth century AD. Alternatively, it may be an early Christian monument: an open-air martyrion from the fourth or fifth century. In Armenia there are many underground martyrions, but no known examples of an open-air one. 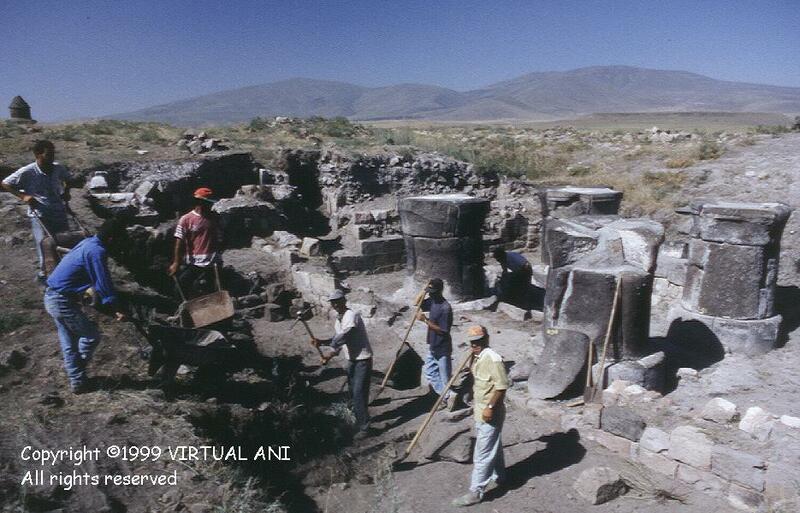 During 1998 and 1999 the fire-temple was re-excavated by Professor Beyhan Karamağaralı, director of the Turkish excavations of Ani. Unfortunately, the term "excavation" is being used loosely. For much of the time archaeologists were not present - only labourers and a foreman (destroying evidence that modern archaeology should seek to preserve and study) - hence the vagueness in parts of her summary report ¹. 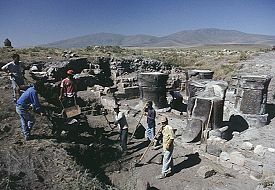 Most of the work consisted of clearing the debris that had accumulated over the site since Marr's excavation, and reassembling the columns that had fallen apart. 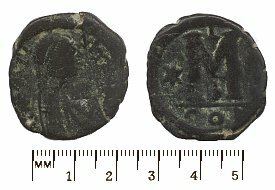 A Byzantine coin from the reign of Justin I (518-527AD) was found by the labourers. It may be the only known coin from this emperor to have been found at Ani ². 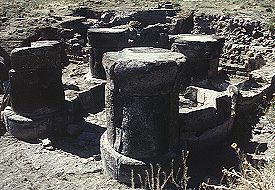 The remains of the fire-temple consist of four squat, circular columns with a diameter of 1.3 metres, resting on cylindrical bases. 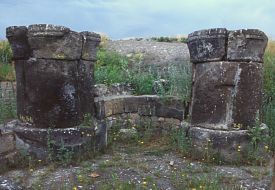 These columns are set 1.8 metres apart and are placed so as to form a square. The columns are not monolithic, but are constructed from smaller blocks of stone. They carry plain capitals that are also constructed from smaller blocks (three or four pieces). No evidence of the structure's roof was found by the Russians (or the Turks). However, the massiveness of the columns suggests a stone roof. 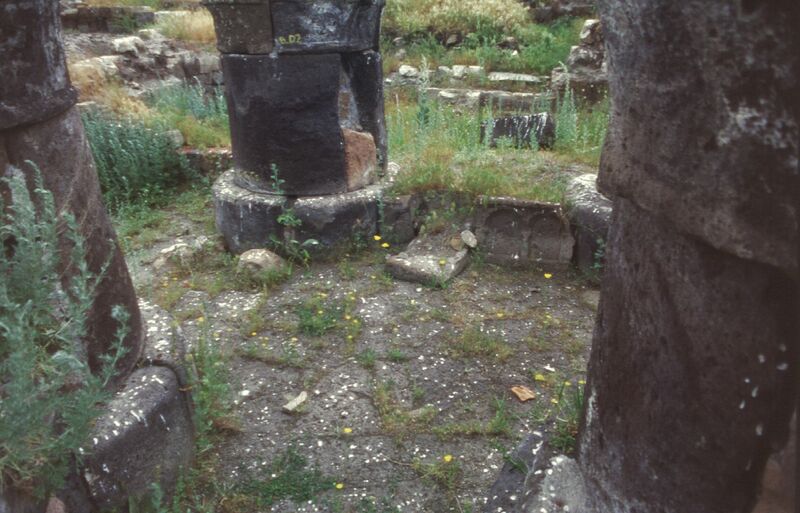 An altar (see the coin depicted at the bottom of this page) would presumably have been sited under this roof, in the centre of the square. 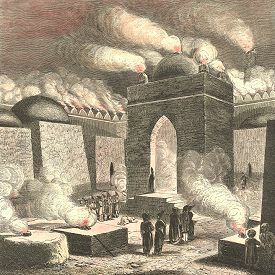 The Russian excavators drew up a conjectural reconstruction showing what the fire-temple may have looked like. A flat roof is equally possible. 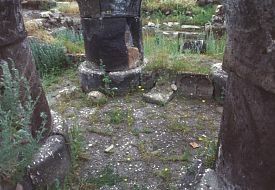 At an unknown date the structure was converted into a small chapel by the construction of four exedera between the columns. These walls were rather crudely built, and little now survives (although at the time of the Russian excavations they reached as high as the capitals). There is a door in the southern wall, and the floor level betwen the eastern pillars is raised to create a bema. The front of the bema is ornamented with a blind arcade of four arches. The Turkish excavation uncovered parts of some surrounding structures (see the plan below, adapted from the plan in Prof. Karamağaralı's published excavation report). These consist of the remains of poorly constructed walls, none surviving to more than half the height of the columns (but at the time of the Russian excavations they also reached as high as the capitals). The difference in building quality indicates that they are from a late period, from a time after the conversion to a chapel. These walls were also constructed at different stages - a fact not recorded on Karamağaralı's plan, which is drawn as if they were all from a single building period. The pillars are constructed from a very gritty, black basalt stone. This is the only apparent example of this type of stone being used at Ani - with one exception. In the citadel wall there is a tower built entirely of re-used blocks of the same stone. 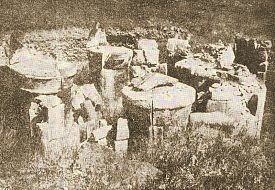 These may have been taken from other parts of the fire-temple complex (an enclosure wall?) or from another building of the same period. 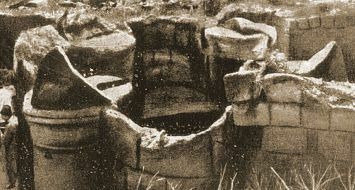 Hollows cut into the ends of these blocks indicate that they came from a structure built using the ancient masonry technique where large sized blocks of stone are held together by iron "dove-tail" cramps set in lead. 1. B. Karamağaralı, 1998 Ani Kazisi, KST, vol. 21, 1999, p431. 2. 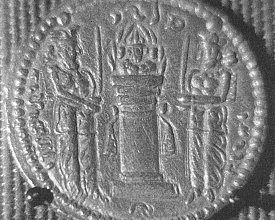 For a list of coins found during the Russian excavations see Bilan Comparé des Découverts Numismatiques à Ani et à Dvin, REA, vol. XVIII, 1984, p.461-469. This page [the fire temple at Ani] was first published in 1999 and was last modified on the 30th October 2001.